Collins Booksellers - Dates: Production, Processing, Food, and Medicinal Values by Manickavasagan, A., 9781439849477. Buy this book online. Of the many varieties of date palms, the species Phoenix dactylifera Linn. is cultivated extensively and traded and consumed worldwide. Dates: Production, Processing, Food, and Medicinal Values draws from a broad spectrum of contributors to present a comprehensive survey of this particular species. The book explores a range of essential facets of what many consider to be a wonder plant-from its cultivation to its potential for medicinal purposes. Divided into four parts, the book begins by examining cultural practices and their implications for date quality. The contributors discuss tissue culture studies, farm water management, mechanization approaches in pollination and harvesting operations, and marketing aspects. The second section focuses on postharvest operations such as drying and explores alternatives for methyl bromide fumigation and value-added products. It also reviews biofuel production from by-products and discusses the issue of waste generated from industry. 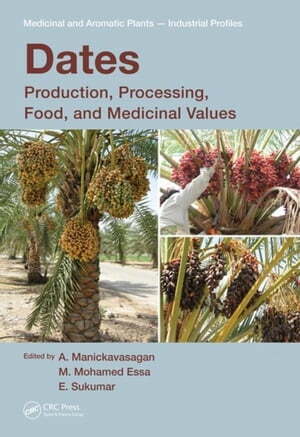 The third part of the book highlights the physical, chemical, and structural characteristics of dates. It reviews fermentative products that use dates as substrate, discusses the fruits as a substitute for added sugar in food, and explores date palm feeding to livestock. The final section discusses the possibilities for nutritional and medicinal use and reviews the use of dates in indigenous medicine. Exploring essential properties and agricultural implications, this volume is a reliable resource for understanding the many aspects of the Phoenix dactylifera Linn.